Time for a valuation update! 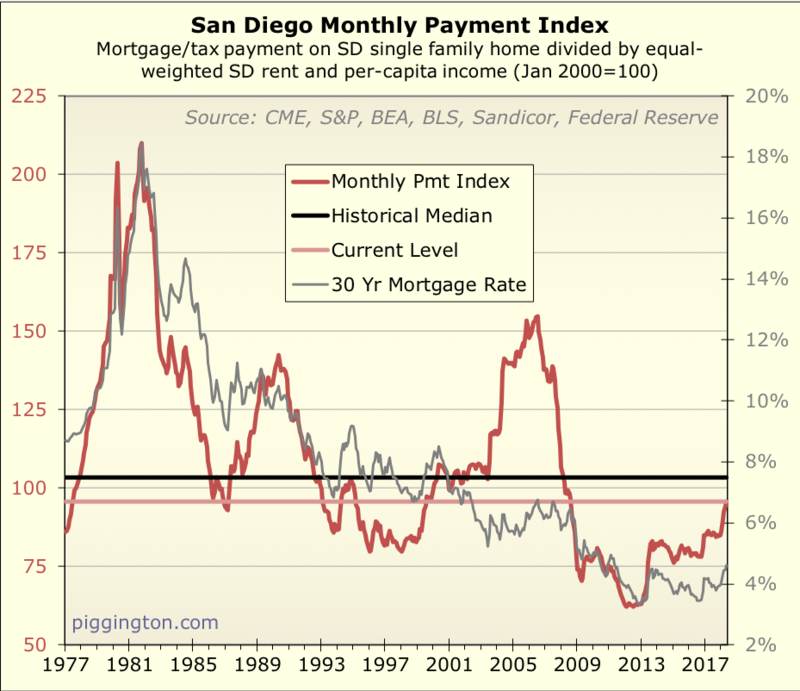 These graphs should be familiar to regular Piggs; for anyone who'd like some background please see these two Voice of San Diego articles: how to measure housing valutions and how mortgage rates impact prices. Friends, this thing is getting pricey. 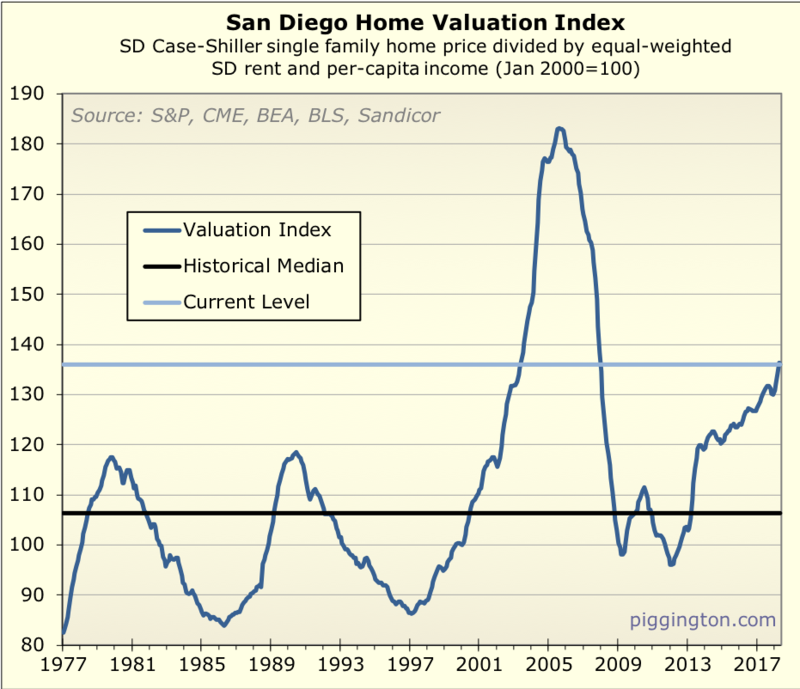 Valuations are still far short of peak levels, when they reached 72% above the historical median. 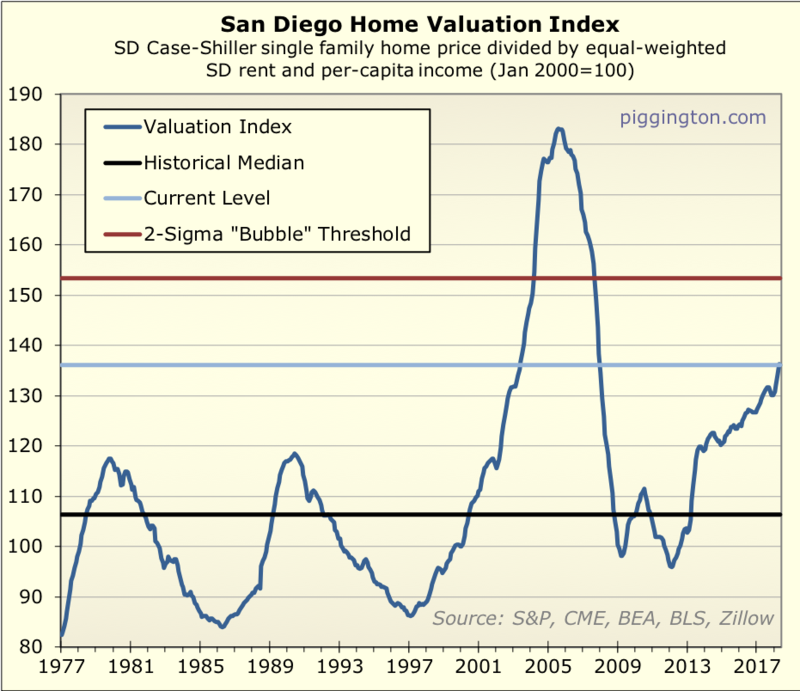 But at the current 28% above the median, we are well above the highest valuation achieved outside last decade's epic housing bubble. So we've got increasingly expensive purchase prices, way higher than outside the bubble and even approaching early-bubble levels. But rates are still low enough that monthly payments are reasonable compared to local rents and incomes. Which is is the same as it's been for a while now, just... more. The relationship between rates and prices is more nuanced than many people believe, as I discussed in the second article linked above. But I think it's reasonable to believe that the prolonged period of low rates has played a big role in helping get valuations up to these levels. If rates were to return to more normal-ish levels, that could very well pressure valuations down towards more normal levels as well. It's possibly worth zooming in on that recent rise in the monthly payment ratio to see what this might look like. It doesn't look like much on the graph, but it was pretty big relatively speaking. 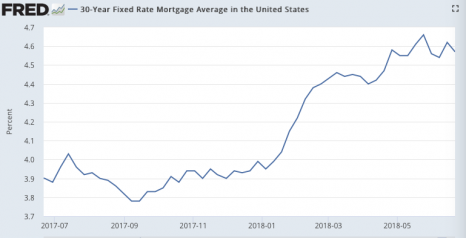 Just since September, mortgage rate increases have driven monthly payments up by over 10%, even if you hold everything else equal. You can see where that would start to bite, were it to keep happening. That's the problem with citing low rates as an excuse for high valuations (in real estate, and any other asset class): it only works for as long as rates stay low. First, the rate thing. I think that is a mitigating circumstance, as described above -- albeit one that could change. Second, you have to distinguish between a market that's "overpriced" and "a bubble." Markets get overpriced all the time; cycling between expensive and cheap is the natural order of things. But a bubble is really a special situation in which people are acting totally irrationally and driving valuations to extremes, so that the only plausible outcome is a price crash. I just don't see that here. Not yet, anyway! So we aren't there yet, especially if you factor rates into the equation. But we aren't far from it either! Submitted by Rich Toscano on May 21, 2018 - 1:30pm. Submitted by bewildering on May 21, 2018 - 9:19pm. That Rent to Income ratio graph shocks me the most. 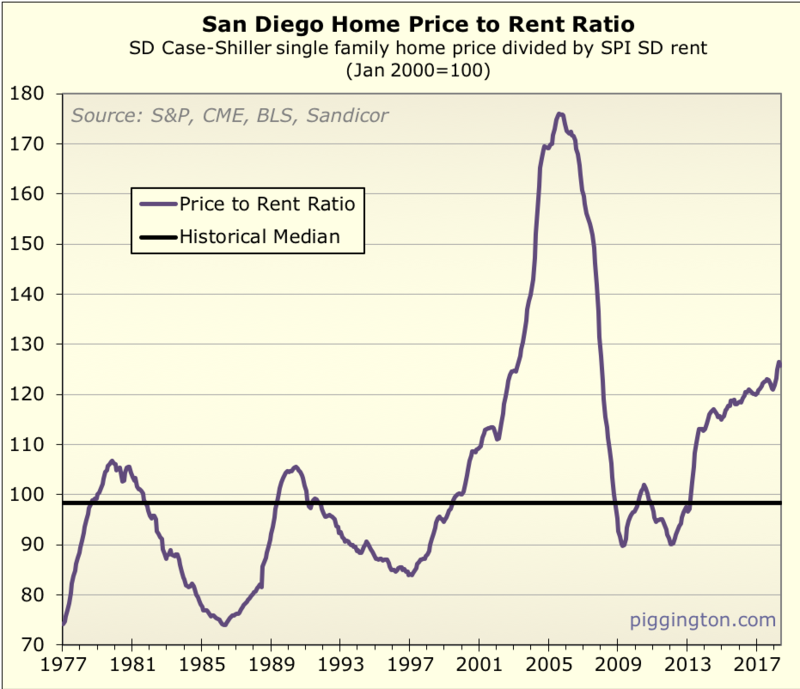 Rents seem to be insane at teh moment yet historically are not too bad. Submitted by SD investor on May 21, 2018 - 10:18pm. Sounds like things are turning... Could you please share your equation for equal-weighted rent and income used to generate figure 1? Interesting bonus graphs. I think rent is going up 5-6% per year, but I hear wages only go up by 2-3%, but from the 1st bonus graph, it seems like wage is keeping up with rent? Is SD wage going up faster than national average? Submitted by pokepud3 on May 22, 2018 - 10:32am. Thanks for the update. 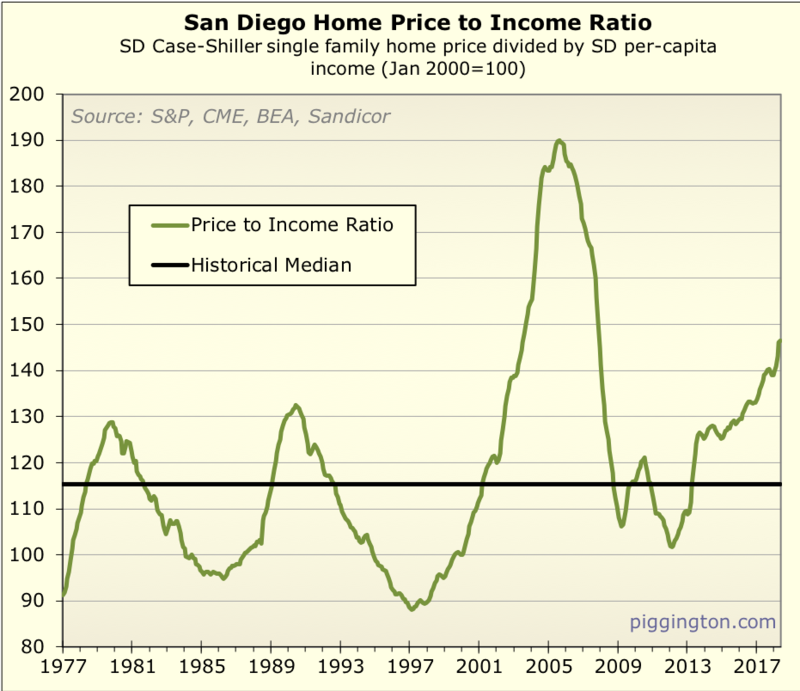 It does seems like it's inching up to the unaffordable mark again for most. They should have never did the QA. Judging at the cycles before 2000, they seem to reset themselves normally during 2009 they didn't allow that to happen. Submitted by Rich Toscano on May 22, 2018 - 5:30pm. I normalize the rent and income series so that 1/1/2000 = 100, then I just average the 2 normalized numbers for each month. If you look at that last bonus graph, rents have been growing faster than incomes for a few years now. Submitted by XBoxBoy on May 22, 2018 - 5:34pm. I hear wages only go up by 2-3%, but from the 1st bonus graph, it seems like wage is keeping up with rent? Is SD wage going up faster than national average? Keep in mind that the mix of jobs in San Diego is slowly changing to have fewer low paying jobs but more high paying jobs. When you hear wages are only going up by 2-3% that's wage inflation. But in San Diego you not only have wage inflation you have a change in the ratio of high to low paying jobs which makes up the difference. Submitted by barnaby33 on May 22, 2018 - 7:01pm. XBoxBoy, from where do you get that idea? I'm not challenging you, but it does seem that San Diego's largest industries are fairly fixed, as are their respective salary ranges. Military/Education/Tourism. Submitted by Rich Toscano on May 23, 2018 - 1:04pm. Outside of govt/military, biggest sector is professional/business services, which I assume includes high tech workers among others. Submitted by wawawa on May 23, 2018 - 3:17pm. For whatever it worth; I went to MAZDA dealer for service on my car. The sales lady that I know told me that their business has been significantly slow during past few month. We might be near peak. Submitted by RichardJamesEsquire on May 23, 2018 - 3:26pm. Mazada has such a small slice of the US pie. How many they sell seems pretty insignificant. Submitted by XBoxBoy on May 24, 2018 - 6:36am. Josh, sorry I don't have specific data to present. (I know a cardinal sin for Piggington.) My comments are mostly based on news articles I've seen in the last several months. I specifically recall one that was on people moving into or out of San Diego. 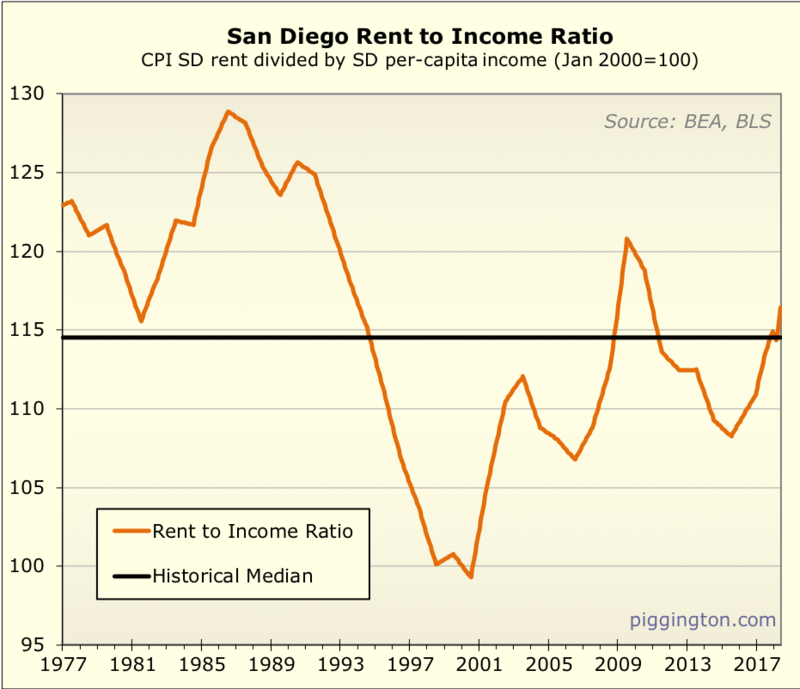 The group moving out had a much higher percent of people whose incomes were below the median wage and the group moving into San Diego were more likely to have incomes above the median wage. My impression from that article and others is that most of the growth in higher income earners is in the tech services sector. Submitted by bewildering on May 26, 2018 - 7:22am. The military pay a fixed amount for rentals. I believe that figure is $2900 for a family at the moment. IMO that figure puts a base level for rent prices. Teachers/UCSD/SDSU/community college faculty all do pretty well. Especially if you count benefits. Submitted by Escoguy on May 28, 2018 - 11:42am. I have a NATO military tenant with an allowance of $3620/month for a SFH in 92027. Multi-year lease with extensions already committed. Regular annual escalation in contract too. Submitted by FlyerInHi on June 14, 2018 - 12:07pm. That's what people,look at in Hawaii also. Submitted by FlyerInHi on June 14, 2018 - 12:20pm. I don't think the ratio is changing. We have more high paying jobs but also plenty of low paying job. Not enough building and whatever gets built is higher end. . The marginal sales are what is driving house inflation. 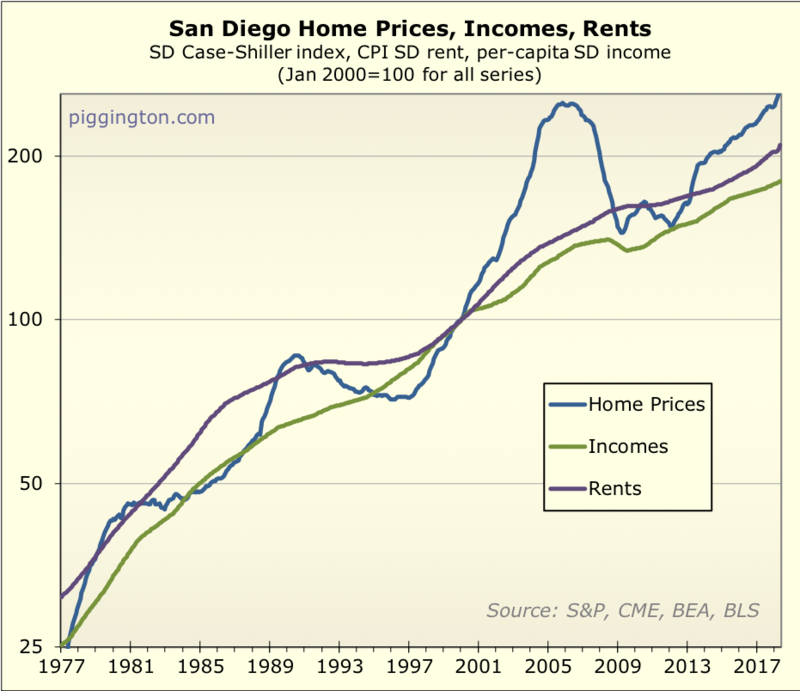 We actually have a real housing emegcency in San Diego. Singapore has been in the news lately. Look at their housing prices -- some of the highest In the world. The difference is that 80% of their population lives in public housing and don't pay more more the 1/3 of their income towards housing. Submitted by gzz on June 25, 2018 - 12:06pm. Still no sign of rising rates. Fed has the power to jack up the short term rates, but long-term has barely budged. 30-year rate is still the same 3% it was in February. The Fed raised its target rate by 0.5% during that time. Submitted by Rich Toscano on June 25, 2018 - 1:15pm. Still no sign of rising rates. That is a pretty strange statement... below is a graph of mortgage rates over the last year. Up 80 bps from the Sept low, and up 60 bps just this year alone. You don't see a sign of rising rates in this chart? Submitted by gzz on July 3, 2018 - 3:53pm. Yes I should have said "nominal rates rising to historic averages."